We are pleased to announce the release of a US National Grid (USNG) Map Book template for ArcGIS Pro. At this time, we are looking for your feedback as this is a new tool for GIS Specialists to produce paper and PDF maps. This ArcGIS Pro template is meant to be a starting point for your map book projects, and it is based on best practices and earlier tutorials by the USNG National Implementation Center (TUNIC) at Delta State University. This does not replace previous templates created in ArcMap, but is a new experimental approach to making map books. We will continue to refine this template and work with other organizations to make improvements over time. Please send us your feedback at admin@publicsafetygis.org! 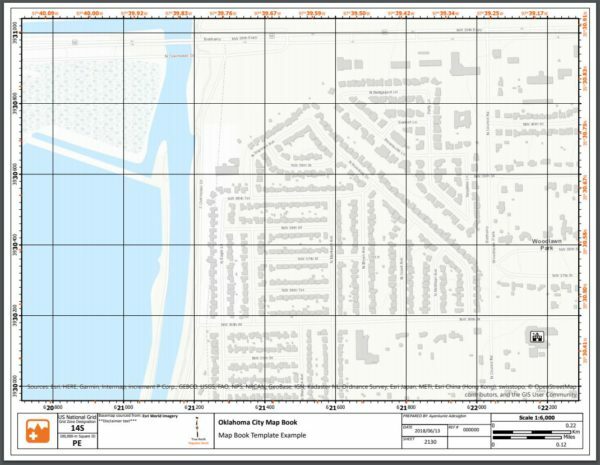 ArcGIS Pro Task for creating a US National Grid Map Book. Example Map created by Johns Hopkins University GIS for EM Student, Ayankunle Adesigbin. Tuesday–Thursday: NAPSG Foundation Booth — The Esri User Conference Exhibition Hall in the Public Safety Neighborhood, directly across from the Exhibit Hall B1 sign – Booth P1 at the Public Safety Kiosk. Please stop by the booth to show us what you are working on and discuss best practices. We will be prepared to discuss NAPSG Foundation resources and events, especially the newly released Core Information Guideline. The purpose of this Guideline is to provide first responders and decision makers with a standardized framework for Core Operational Information in support of flood and other hazards. This will be a great opportunity to reconnect with old friends and network across the Public Safety GIS Community. We look forward to hearing what you have learned and put into practice in 2018. See you there!